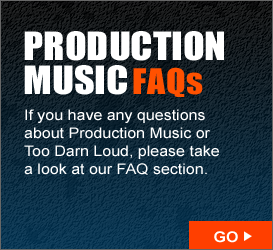 Welcome to Too Darn Loud. We create beautiful production music. Too Darn Loud provide innovative and engaging high quality production music for Film, TV, Advertising and Radio. Our music is licensed directly through us and Performance Rights through PRS (Performing Rights Society) in the UK and equivalent overseas societies. From our website, you can view our music catalogue, audition tracks and submit a license request for all of the tracks available. If you have any questions, or would like to talk to us about your requirements, please do not hesitate to get in touch.